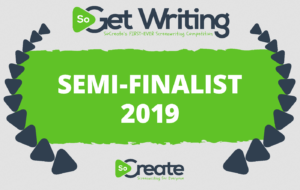 Got the word this week that a script of ours made the semifinals in SoCreate’s first competition, “Get Writing.” This is our second semifinals so far this year (a novel in the Screencraft “Cinematic Books” competition and now this script contest). If your ms is polished and ready, you get it in front of people you want to see it (look to see who the judges are). If you do place in the competition, you get to put that on your query letters, and like anything else in the arts, people do like to see confirmation that you’re good. Just human nature — they’re getting so many queries, so trying to weed through them must be like trying to shovel a mountain with a teaspoon. Any hint that this rock might be better than that rock must be helpful. Some offer prizes. Not just money. Revise & Resub offers help from a professional editor. PNWA offers feedback, similar to the report a script reader issues for a studio when reading a script. PitWars offers mentoring. See if the prize is something you would like to win. If you get anywhere in the competition, it’s validation. Sure, sure, you should be confident in your work and all, but who couldn’t use a bit of encouragement? I’ve had that award notification arrive on the exact day I thought I was hopeless and should give up writing to herd goats. Pacific Northwest Writers Association (https://www.pnwa.org/default.aspx). Annual competitions for unpublished and published works. Offers feedback. I can say that I have gotten feedback twice, once very useful (thoughtful, comprehensive, easily applicable to the work) and once not much (too vague). The useful feedback was useful enough so that I entered again. Revise & Resubmit (https://www.reviseresub.com/ ). Offers 5 weeks of help from a professional editor. Entered for the first time this year. I’ll let you know what happens. #PitMad and #PitWars (https://pitchwars.org/ ). Offers mentoring. I may enter Pitch Wars this year. If I do, I’ll let you know what happens. Screencraft Cinematic Books competition (https://screencraft.org/screenwriting-contests/ ). Offers a cash prize, mentoring, and introduction to film industry people. There are others, such as the Writer’s Digest competition, that have been around for years, offer prizes, and publish your short story. It can be a good experience as you ready yourself to send out queries. If nothing else, it gets you used to sending your work out to people who will judge it, which is what is going to happen at every stage of publication from agent hunting to getting reviews. Are you ready to become a “contested” writer? This entry was posted in Uncategorized and tagged @pnwa, @ReviseResub, @screencrafting, #amquerying, #AmWriting, #PitMad, #RevPit, #writer, #writerlife, #writers, writerslife. Bookmark the permalink.